The FOX-S flail mower is used for grass cutting (mulching) and verti-cutting on grass fields. Engineered to be mounted on light tractors, 3 points linkage, with low power with high PTO shaft linkage position. 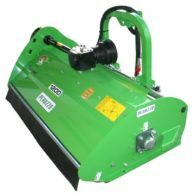 The machine can be fitted on rear tractor and the 3 point linkage can be offset of 20 cm on both tractor sides by mechanical or hydraulic ram. Universal offset 3 point linkage by mechanical adjustment. 540 rpm. with overun clutch. VERTICUT BLADES: 3 mm thickness. FRONT CASTOR WHEELS: 2 pieces-adjustable in height.